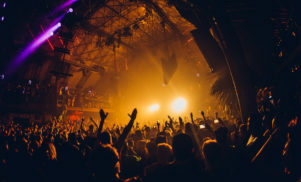 Italian techno titan Marco Carola launched Music On in 2012 and it’s been an Ibiza staple ever since, bringing the finest techno and house sounds to the White Isle via an enviable line-up of in-demand residents and essential guests. FACT asked the club’s residents to pick the tracks that define Music On for them. Music On has been a go-to party for discerning house and techno fans since way back in 2012, when Marco Carola kicked off the event, quickly making a splash with his notorious marathon sets. Over time, Carola and his collaborators have made Music On an essential Ibiza destination, curating a cast of residents that now includes Paco Osuna, Stacy Pullen, Apollonia, Leon, Joey Daniel and Marco Faraone. And this year alone, Music On has invited Derrick May, Miss Kittin, Felix Da Housecat, Claude Vonstroke and plenty more artists to perform guest sets. We asked Music On’s residents to pick a track that defines Music On for them, and you can check them out below. To check out Music On’s 2017 lineup head here. Next up on September 1 is an all-nighter featuring Stacey Pullen, Marco Carola, Apollonia and Marco Faraone. Apollonia: “Last summer, Dan Ghenacia was digging through his own record collection when he found a rare gem, a priceless Italian jewel. Back in the ‘90s when he first picked up the EP, Dan was spinning the B-side, with no vocal. Recently, after a few weeks of pondering, Dan decided to give the vocal version a spin. Joey Daniel: “The first time I played this track for a big crowd was at Sunwaves Festival. It was a special moment for me, it was my first gig at Sunwaves Festival and was also my first time playing after Marco Carola – I was closing the main stage with an 11-hour set. So this track has special memories for me.